Apologies for the bad Photoshop. This is clearly not something I do a lot. I would take Idris Elba in anything. Quiet, mild mannered “Clark Kent” (an obviously assimilated name) from a foreign land torn by war and taught the American ways, ignored by women and who turns into “Kal El” a superhero. Really, is there any more appropriate Asian American analogy or what? Dustin Nguyen for the Win! why do i “deserve” a blackface version of white superheroes? did I slap someone’s mother? i’d rather support black heroes that are actually black. Uhm, both Dwayne Johnson and Idris Elba are actors of colour. Casting them might racially cross-cast characters that have been historically Caucasian, but they definitely would not be “Blackface”. I would submit that of the popular male actors in Hollywood today, these two best embody the personas of Superman and Batman respectively. Idris Elba is totally capable of playing brooding, violent, and potentially psychotic yet with a heroic streak (re: Luther), and The Rock is just superhumanely built and exudes an intrinsic Boy Scout good-naturedness. Yet, why won’t they be cast? Because they aren’t White. Because fans insist that a Black actor playing these actors would be “blackface” of White superheroes. Meanwhile, White actors are readily cast into roles originally intended to be characters of colour (see Avatar: the Last Airbender as an example), and fans don’t care at all. So yes, this is the Man of Steel 2 you deserve. Because these two actors would be AWESOME as the World’s Finest, if fans could be open-minded enough to let it happen. And BTW, Geoffrey, I’m curious to know which Black superheroes currently in canon would be compelling enough to make a great live-action adaptation. Because most of today’s Black superheroes are one stereotype or another. 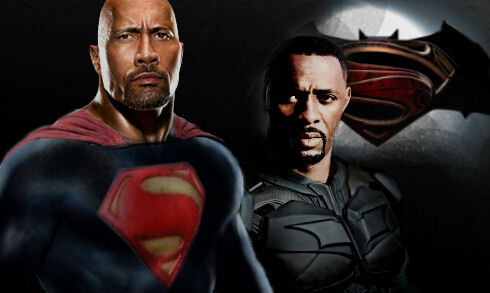 I mean — would you really support Hollywood attempting a live-action Luke Cage over The Rock as Superman?